Combi-rigs are an effective way of presenting a hook bait in order to catch a carp. There are numerous variations of combination fishing rigs that can be made up easily on the bank of a lake. The most common types are made up of a stiff length of fluorocarbon fishing line, with a smaller section made of a type of braid material. 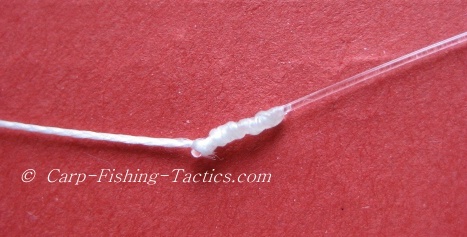 The braid end section is attached to the hook. Combi carp rigs can be used on many different lake beds, from silt to gravel. I personally like to use them on a gravel bottom, but for gravel, I would tie a combi-rig made up of 2 different types of fluorocarbon fishing lines. The thicker would be very stiff, about 20 pounds breaking strain, and the hook link section would be about 8 pound breaking strain. This would almost guarantee that the carp cannot see any of the fishing lines when it sits on the bottom of the lake. The photos below show a few different types of combi carp fishing rigs that I have used in the past. The pictures further down also show what the carp may see when the rig is on the bottom. They illustrate how difficult it is to completely hide the end tackle! The best thing about making your own combi-rigs is you can decide on the length of the braid so it suits your specific fishing situation. 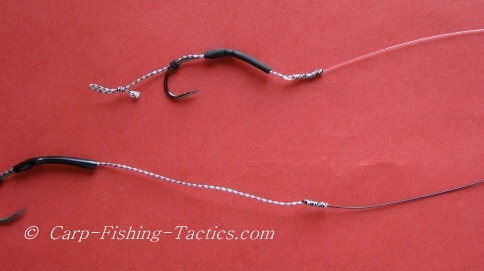 Buying the pre-tied combi-rigs means you have to make do with the braid length already tied. In the photo above, I tied one with a very short braid length, and one much longer. I generally prefer the shorter braid lengths. I believe the stiff rig properties work much better when it's about 1- 2 inches from the combi knot to the eye of the hook. As a result, carp find it much harder to eject the rig. The bottom combination carp rig has a braid length of about 4 inches. I think the rig can tangle much easier when it's this long. The hook and bait can flick up easier during the cast. It's also hard to know exactly how the hook link braid will land on the bottom, it may fold over and lay over the stiff boom. The photo above shows another combi style carp rig using fluorocarbon for the stiff boom section. 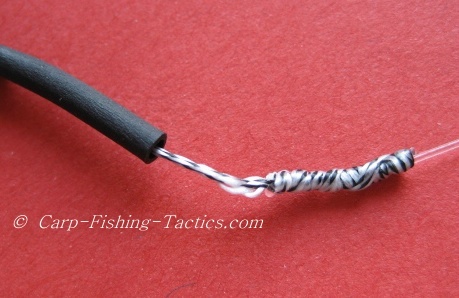 I used super silk material for the hook link as this is easy to colour the braid to suit the lake bed. For this one, I used a longer hair and a bigger hook. I use this combi carp rig for snowman presentations! You can use black amnesia monofilament line for boilie presentation on silt beds, and fluorocarbon or normal monofilament fishing line for gravel presentation. Although, remember to also change the colour of the braid to suit the lake bottom! See how these combi-rigs look in water! 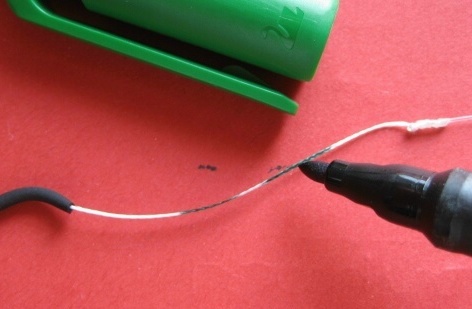 Using super silk braid makes it easier to change the colour quickly with a pen. I always carry a pack of different coloured pens so I can quickly change any pre-tied combi-rigs on the bank. 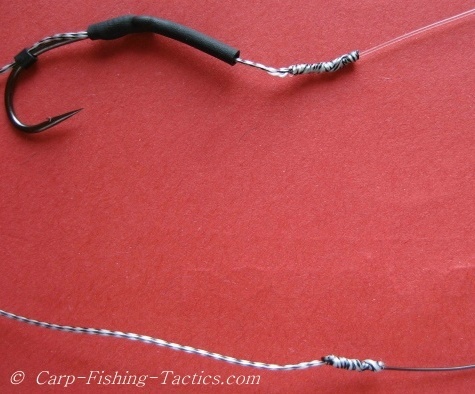 Always use a strong knot to tie up a combi carp rigs. This combi knot is easy to tie up. Please note, combi knots info coming soon!! How easily a fluorocarbon fishing line can show up on silt beds. The photo above shows a combi rig with a fluorocarbon stiff line presented on silt. Notice how easy you can see the fluorocarbon line on the silt bed. This photo shows how well hidden the black amnesia mono looks on top of silt, it blends in nicely. It may be a good idea to pre-tie combi-rigs using both fluorocarbon and amnesia, then they are ready to be used on the appropriate lake bed! How the combi carp rigs look underwater!